Traditional Catholic thought did not consider Zionism in any form. However Christian advocacy grew after the Protestant Reformation in support of the restoration of the Jews. A contemporary Israeli historian suggests that evangelical Christian Zionists of the 1840s "passed this notion on to Jewish circles", while Jewish nationalism in the early 19th century was widely regarded with hostility by British Jews. Christian advocacy of the restoration of the Jews in Palestine was first heard following the Protestant reformation, particularly in the English-speaking world among the Puritans. It was common practice among Puritans to anticipate and frequently pray for a Jewish return to their homeland. John Owen, a 17th-century English Covenant theologian, for example, wrote: "Moreover, it is granted that there shall be a time and season, during the continuance of the kingdom of the Messiah in this world, wherein the generality of the nation of the Jews, all the world over, shall be called and effectually brought unto the knowledge of the Messiah, our Lord Jesus Christ; with which mercy they shall also receive deliverance from their captivity, restoration unto their own land, with a blessed, flourishing, and happy condition therein." John Gill took a similar position. that the Lord Jesus will come in person to introduce the millennial age, when Israel shall be restored to their own land, and the earth shall be full of the knowledge of the Lord; and that this personal and premillennial advent is the blessed hope set before us in the Gospel for which we should be constantly looking. The crumbling of the Ottoman Empire threatened the British route to India via the Suez Canal as well as sundry French, German and American economic interests. In 1831 the Ottomans were driven from Greater Syria (including Palestine) by an expansionist Egypt, in the First Turko-Egyptian War. Although Britain forced Muhammad Ali to withdraw to Egypt, the Levant was left for a brief time without a government. The ongoing weakness of the Ottoman Empire made some in the west consider the potential of a Jewish state in the Holy Land. A number of important figures within the British government advocated such a plan, including Charles Henry Churchill. Again during the lead-up to the Crimean War (1854), there was an opportunity for political rearrangements in the Near East. In July 1853, Anthony Ashley-Cooper, 7th Earl of Shaftesbury, who was President of the London Society for Promoting Christianity Amongst the Jews, wrote to Prime Minister Aberdeen urging Jewish restoration as a means of stabilizing the region. Late-19th-century non-Messianic Restorationism was largely driven by concern over the fate of the Jews of the Russian Empire, beset by poverty and by deadly, government-inspired pogroms. It was widely accepted that western nations did not wish to receive Jewish immigrants. Restorationism was a way for charitable individuals to assist oppressed Jews without actually accepting them as neighbors and fellow-citizens. In this, Restorationism was not unlike the efforts of the American Colonization Society to send blacks to Liberia and the efforts of British abolitionists to create Sierra Leone. Winston Churchill endorsed Restoration because he recognized that Jews fleeing Russian pogroms required a refuge, and preferred Palestine for sentimental reasons. In 1839, the Church of Scotland sent Andrew Bonar, Robert Murray M'Cheyne, Alexander Black and Alexander Keith on a mission to report on the condition of the Jews in Palestine. Their report was widely published. They traveled through France, Greece, and Egypt and, from Egypt, overland to Gaza. On the way home they visited Syria, the Austrian Empire and some of the German principalities. They sought out Jewish communities and inquired about their readiness to accept Christ and, separately, their preparedness to return to Israel as prophesied in the Bible. Alexander Keith recounted the journey in his 1844 book The Land of Israel According to the Covenant with Abraham, with Isaac, and with Jacob. It was also in that book that Keith used the slogan that became popular with other Christian Restorationists, a land without a people for a people without a land. In 1844 he revisited Palestine with his son, George Skene Keith (1819–1910), who was the first person to photograph the land. In the decades leading up to the establishment of Israel in 1948, the most prominent and politically active American Christian supporters of Zionism were liberal and mainline Protestants whose support for the movement was often unrelated to their interpretation of the Bible. These Christian supporters of Zionism viewed Palestine as a needed safe haven for Jews fleeing intensifying persecution in Europe and often understood their support for the movement as part of a broader effort at interfaith rapprochement. The Pro-Palestine Federation, a Christian pro-Zionist organization founded in 1930, called both for the promotion of “goodwill and esteem between Jews and non-Jews” and for the British government to adhere to the terms of its Mandate for Palestine, which pledged support for the establishment of a Jewish national home. Amidst World War II and growing awareness of the Holocaust, American Jewish Zionists helped coordinate the establishment of two non-Jewish Zionist organizations, the American Palestine Committee and the Christian Council on Palestine, which were later merged into the American Christian Palestine Committee (ACPC). The ACPC, which was composed largely of liberal and mainline Protestants, became the leading American Christian lobby in support of the creation of a Jewish state in Palestine. After the establishment of Israel in 1948, the ACPC continued its lobbying efforts. For instance, it coordinated opposition to the United Nations’ efforts to internationalize the city of Jerusalem, which was divided between Israel and Transjordan in the 1948 War. During these years, premillennialism (including its dispensationalist variety) did grow in popularity among conservative American Protestants. Many premillennialists viewed the Zionist movement as at least a partial fulfillment of biblical prophecy or a modern fulfillment of God’s covenantal promises to the Jewish people. Southern Baptist missionary Jacob Gartenhaus, himself a convert from Judaism, argued in the 1930s that “Zionism is going to win whether anybody likes it or not…To oppose it is to oppose God’s plan.” For the most part, though, such beliefs did not translate into political action on behalf of the movement in this era. One slight exception was J. Frank Norris, a fundamentalist Baptist who split time between pulpits in Fort Worth, Texas, and Detroit, Michigan. While Norris did not organize lobbying efforts in the way that the ACPC did, he did preach to his followers that it was their Christian duty to support the Zionist cause and wrote President Truman in support of Zionist claims to Palestine in 1947 and 1948. Norris also loosely coordinated with the ACPC, at times publishing their materials in his periodical, The Fundamentalist. In the decades since the establishment of Israel, and especially since the 1967 Six Day War, the most prominent American Christian supporters of Israel have come from the fundamentalist and evangelical wings of American Protestantism. Hal Lindsey, one of the most popular American promoters of dispensationalism, has written in The Late Great Planet Earth that per Ezekiel 39:6–8, after Jews fight off a "Russian" invasion, Jews will see this as a miracle and convert to Christianity. Their lives will be spared the great fire that God will put upon Russia and people of the "coastlands." And, per Zechariah 13:8–9, one third of Jews alive who have converted will be spared. Lindsay has been critiqued for highly specific, failed predictions even by those who share his eschatology, like John MacArthur. Examples of Protestant leaders combining political conservatism with Christian Zionism are Jerry Falwell and Pat Robertson, leading figures of the Christian Right in the 1980s and 1990s. Falwell said in 1981: "To stand against Israel is to stand against God. We believe that history and scripture prove that God deals with nations in relation to how they deal with Israel." They cite part of the blessing of Isaac at Genesis 27:29, "Those who curse you will be cursed, and those who bless you will be blessed." 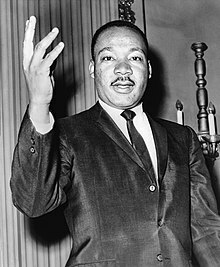 Martin Luther King, Jr. has also been cited as a Christian supporter of Israel and Zionism. The Latin Patriarchate of Jerusalem (Catholic), the Syriac Orthodox Archdiocese of Jerusalem, the Episcopal Church in Jerusalem and the Middle East and the Evangelical Lutheran Church in Jordan and the Holy Land, in 2006 published the Jerusalem Declaration on Christian Zionism, which rejects Christian Zionism as substituting, in its view, a political-military program in place of the teachings of Jesus Christ. It criticizes Christian Zionism as an obstacle to peace and understanding in Israel-Palestine. ^ Friedman, Isaiah (1991-01-01). The Question of Palestine. New brunswick, NJ: Transaction. p. 458. ISBN 978-0887382147. ^ a b c d e f g h i j Lewis, Donald (2 January 2014). The Origins of Christian Zionism: Lord Shaftesbury And Evangelical Support For A Jewish Homeland. Cambridge: Cambridge University Press. p. 380. ISBN 9781107631960. ^ a b Hillel Halkin. "Power, Faith, and Fantasy by Michael B. Oren". Commentary magazine. Retrieved 1 November 2013. ^ Boyer, Paul S., When Time Shall Be No More: Prophecy Belief in Modern American Culture, Cambridge, MA: Harvard University Press, 1992. ^ a b c d e f g Murray, Iain (June 1971). the Puritan Hope. Edinburgh: Banner of Truth. p. 326. ISBN 9780851512471. ^ a b Owen, John "Complete Works", Vol.17. Exercitation 18, p. 560. ^ a b Rutherford, Samuel (June 1973). Letters of Samuel Rutherford. Edinburgh: Banner of Truth. p. 208. ISBN 9780851511634. ^ a b c "A Wesley 'Zionist' Hymn? Charles Wesley's hymn, published in 1762 and included by John Wesley in his 1780 hymn-book, A Collection of Hymns for the use of the People called Methodists". The Wesley Fellowship. 2010-07-01. Archived from the original on 2014-07-05. Retrieved 2014-07-05. ^ a b Stephen J. Stein, editor, "Introduction," Jonathan Edwards, Works, Apocalyptic Writings, V. 8, pp.17-19. ^ Rodenbeck, Max (2007-01-26). "Of missionary zeal and its consequences". New York Times. Archived from the original on 2015-08-23. Retrieved 2015-08-23. ^ Ben David, Lenny (2015-08-14). "American 'Manifest Destiny' Heads to the Holy Land in 1847". Israel National News. Archived from the original on 2015-08-23. Retrieved 2015-08-23. ^ Sandeen, Ernest (2008-08-01). Roots of Fundamentalism: British and American Millenarianism 1800-1930. Chicago: University of Chicago Press. p. 336. ISBN 9780226734682. ^ a b Sermon preached 17th November 1839, after returning from a "Mission of Inquiry into the State of the Jewish People"
^ Mel Scult (1978). Millennial Expectations and Jewish Liberties: A Study of the Efforts to Convert the Jews in Britain, Up to the Mid Nineteenth Century. Brill Archive. p. 91. ^ Persecution of the Jews, The Living Age, Littell, Son & Company, 1883, p. 604 ff. ^ Kark, Ruth (1994). American Consuls in the Holy Land, 1832-1914. Wayne State University Press. p. 23. ^ Valley of vision: or, The dry bones of Israel revived: an attempted proof, from Ezekiel, chap. xxxvii, 1-14, of the restoration and conversion of the Jews, George Bush, 1844 "When the Most High accordingly declares that he will bring the house of Israel into their own land, it does not follow that this will be effected by any miraculous interposition which will be recognized as such....The great work of Christians, in the mean time, is to labor for their conversion. 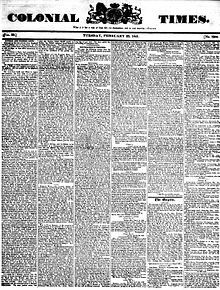 In this they are undoubtedly authorized to look for a considerable measure of success, though it be admitted that the bulk of the nation is not to be converted till after their restoration ; for it is only upon the coming together of bone to his bone that the Spirit of life comes into them, and they stand up an exceeding great army." ^ a b c Merkley, Paul (June 2, 1998). The Politics of Christian Zionism 1891-1948. Florence, Kentucky: Routledge. p. 240. ISBN 9780714644080. ^ Yaakov Ariel, On Behalf of Israel; American Fundamentalist Attitudes toward Jews, Judaism, and Zionism, 1865–1945 (New York: Carlson Publishing, 1991), pp. 70–72. ^ Jerry Klinger (July 2010). "Reverend William H. Hechler—The Christian minister who legitimized Theodor Herzl". Jewish Magazine. Archived from the original on 2014-07-06. Retrieved 2014-07-06. ^ a b c Sundquist, Eric J. (2005). Strangers in the land: Blacks, Jews, post-Holocaust America. Cambridge, MA: Harvard University Press, p. 110. ^ Caitlin., Carenen, (2012). The fervent embrace : liberal Protestants, evangelicals, and Israel. New York: NYU Press. ISBN 9780814708378. OCLC 779828048. ^ 1934-, Merkley, Paul Charles, (1998). The politics of Christian Zionism, 1891-1948. London: F. Cass. ISBN 9781136316296. OCLC 815969328. ^ Carenen, Caitlin (2010-10-01). "The American Christian Palestine Committee, the Holocaust, and Mainstream Protestant Zionism, 1938–1948". Holocaust and Genocide Studies. 24 (2): 273–296. doi:10.1093/hgs/dcq025. ISSN 8756-6583. ^ Robins, Walker (2017). "Jacob Gartenhaus: The Southern Baptists' Jew". Journal of Southern Religion. 19. ^ 1956-, Hankins, Barry,. God's rascal : J. Frank Norris & the beginnings of Southern fundamentalism (Paperback ed.). Lexington, Kentucky. ISBN 9780813149899. OCLC 903955383. ^ MacArthur, John (2011-04-03). "Sermon: The Final Generation". Grace To You Website. Archived from the original on 2017-05-14. Retrieved 2017-05-14. ^ Rammy Haija. "The Armageddon Lobby: Dispensationalist Christian Zionism and the Shaping of US Policy Towards Israel-Palestine." Holy Land Studies 5(1): 75–95. 2006. ^ The Jerusalem Declaration on Christian Zionism in Voltaire Network, 22 August 2006. ^ "ncccusa.org". Archived from the original on 23 October 2013. Retrieved 1 November 2013. ^ "Position on Christian Zionism". Rabbinical College of America. Retrieved 1 November 2013. ^ Lebor, Adam (October 14, 2007). "Over the Line". The New York Times. ^ "The building of settlements in the occupied territories has always been illegal under international law and an obstacle to peace." Avi Shlaim, "A Betrayal of History" in The Guardian (February 22, 2002, London), reprinted in The Other Israel (New York: The New Press 2002) at 45-50, 48. The author is professor of international relations at Oxford University. ^ "Presbyterians reject church group's anti-Zionist study guide The guide, 'Zionism Unsettled,' posits that the Israeli-Palestinian conflict is fueled by a 'pathology inherent in Zionism.'". Haaretz. Retrieved 2014-06-29. ^ *[permanent dead link]. Cf. .
^ "With God On Our Side". ^ The Church Of Scotland (1845). Narrative of a Mission of inquiry. Philadelphia: Presbyterian Board of Publication. p. 535. ^ "Church of Scotland: Jews do not have a right to the land of Israel A new church report challenging Jewish historic claims and criticizing Zionism has drawn anger and harsh condemnation from the local Jewish community". Haaretz. Retrieved 2014-06-29. ^ "Church of Scotland Thinks Twice, Grants Israel the Right to Exist". The Jewish Press. 2013-05-12. Retrieved 2014-06-29. ^ "Support work for peace in divided region, Synod urged". Church Times. 2012-07-13. ^ a b "Board of Deputies statement on the Synod EAPPI vote". Jewish Chronicle. 2012-07-12. Retrieved 2014-08-02. ^ "The Synod should be ashamed for endorsing the Ecumenical Accompaniment Programme". Daily Mail. 2012-07-12. Archived from the original on 2014-08-02. ^ Ismael, Tareq Y.; Rippin, Andrew (2010). Islam in the Eyes of the West: Images and Realities in an Age of Terror. Routledge. p. 42. ISBN 9780415564144. ^ Davis, Moshe (1995). America and the Holy Land (with eyes towards Zion). Prager. p. 26. ISBN 9780275946210. ^ a b "Herbert W. Armstrong's interpretation of the 3 ½ years". ^ a b c d e f Brog, David, Standing with Israel, FrontLine, 2006. ^ Jordana Horn (2011-05-18). "Glenn Beck heading to Israel again – for summer rally". Jerusalem Post. Retrieved 2011-06-21. ^ Carey, Juanita (2000). E.W. Bullinger: A Biography. Grand Rapids: Kregel. p. 281. ISBN 9780825423727. ^ Cennick, John (1988). Life and Hymns Of John Cennick, Hymn 87. Herpendon, Hertfordshire: Gospel Standard Trust Publications. p. 110. ISBN 9780903556804. ^ "Sen. Ted Cruz emerges as a leading defender of Israel, wows Zionist groups". 2 December 2014. Archived from the original on 2015-01-27. Retrieved 2014-12-02. ^ "'Dr. Michael D Evans on LinkedIn'". ^ Spector, Stephen. "Evangelicals in Israel: The Story of American Christian Zionism". ^ https://www.facebook.com/JenniferRubinBlogger. "Christians 'Stand with Israel'". Washington Post. ^ Lindsey, Hal, The Late Great Planet Earth. Zondervan, 1970. pp. 42–58. ^ Clark, Victoria, Allies for Armageddon: The Rise of Christian Zionism, Yale University Press, 2007. ^ "Israeli library uploads Sir Isaac Newton's theological texts". Daily Telegraph. 2012-02-16. Archived from the original on 2016-03-18. Retrieved 2016-03-18. ^ "'Godfather of Israeli Army' John Henry Patterson's Belfast Memorial Defaced With 'Scum,' 'Nazis'". Algemeiner. 2017-03-19. Archived from the original on 2017-03-20. Retrieved 2017-03-20. ^ "The Coming of the Son of Man, section IX Israel, E J Poole Connor". Sovereign Grace Advent Testimony. Archived from the original on 2014-07-12. Retrieved 2014-07-12. ^ "Father of Faithful Abra'm, Hear". John Rippon's Selection of Hymns from the Best Authors, no 422. 1807. Retrieved 2015-03-28. ^ Simeon, Charles (9 February 2012). Horae Homileticae, Or, Discourses (in the Form of Skeletons) Upon the Whole Scriptures Volume 6. General Books LLC. p. 190. ISBN 9781235837920. ^ Walvoord, John F. Armageddon, Oil and the Middle East Crisis. Zondervan, 1970, rev. ed. 1990. pp. 65–108. ^ "Charles Orde Wingate Biography". Jewish Virtual Library. Archived from the original on 2017-03-20. Retrieved 2017-03-20. This page was last edited on 26 March 2019, at 02:41 (UTC).